These are the basic steps required to upload an image whilst creating/editing a post. 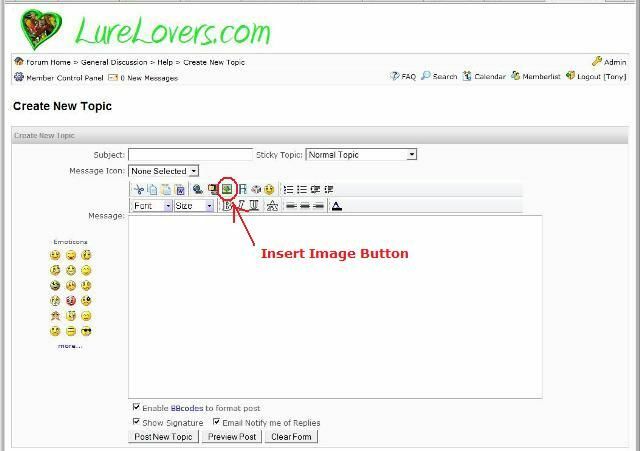 The image below is indicative of the screen you will see when adding/replying to a post on LureLovers.com. You get to this screen by clicking on the "Post Reply" button found at the bottom Left Hand Side of every topic thread, or by clicking on "Create New Topic" after navigating to the discussion forum you wish to post the new topic in. 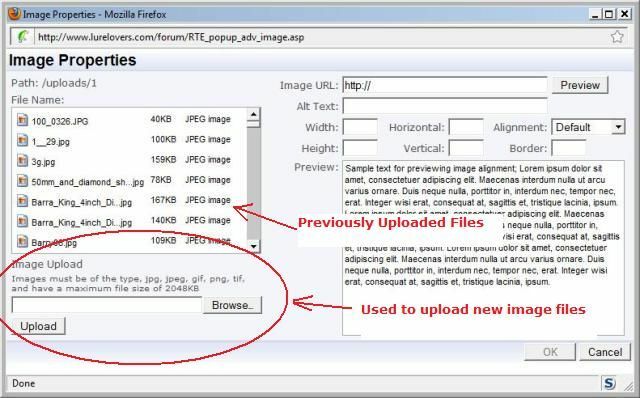 Step 2: To upload a new image file click on the "Browse" button, a file open screen appears. Navigate to the folder on your computers hard disk that contains the image file you wish to upload, then select the image you wish to upload, and click "Open"
The path to the file on your local computer will now be shown to the left of the browse button. The file will be uploaded to the server. After the upload is completed the image will be visible in the preview on the right hand side of the Insert Image Screen as shown below. Step 4: Click "OK" (after the image is visible in the preview window) - the image will then be inserted into your post. If you have previously uploaded image files they will be shown in the list at the top left of the screen. These images can be added to a post simply by clicking on the image in the list you wish to use (you will not need to upload it again if you wish to use it in more than one post) - A preview of that image will then be shown and you simply click on the "OK" button to add the image to your post. It is highly recommended that you crop and resize your images prior to uploading as this will enhance how well the image appears in your post, and will make the upload smaller making it faster and using less of your internet bandwidth. Once you've mastered uploading images into your posts you might like to check out Tips for working with images. 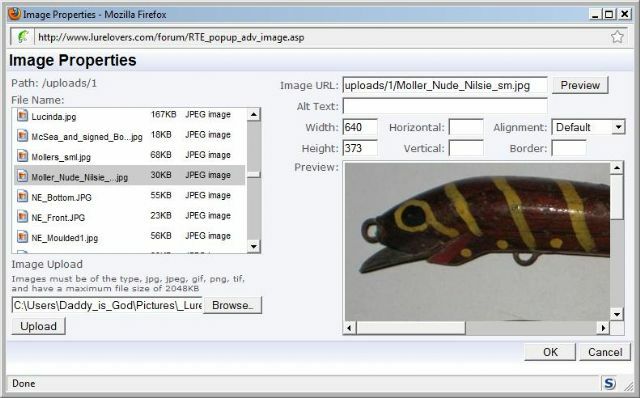 LureLovers.com currently allows image files up to 2mb in size to be uploaded, although the image will be resized on upload to a maximum of 640 pixels in width so that the image is displayed on the page without the need for those viewing it to scroll. This also reduces the filesize so images do not take too long to download when viewing the post. I hope you find this tutorial usefull, should you experience difficulties please place a post in the help section and myself or another member will help sort it out. For the love of Fishing Lures.